The McMahons’ 1976 New Britain Taxes Went Unpaid……In Memoriam: Stanley Pac…..Five Ways To Help Get Out The Vote…. It’s not the tax windfall that municipal government is looking for these days, but last week’s uncovering of Vince and Republican Senate candidate Linda McMahon’s bankruptcy records by the Day of New London shows the City of New Britain was one of the creditors. 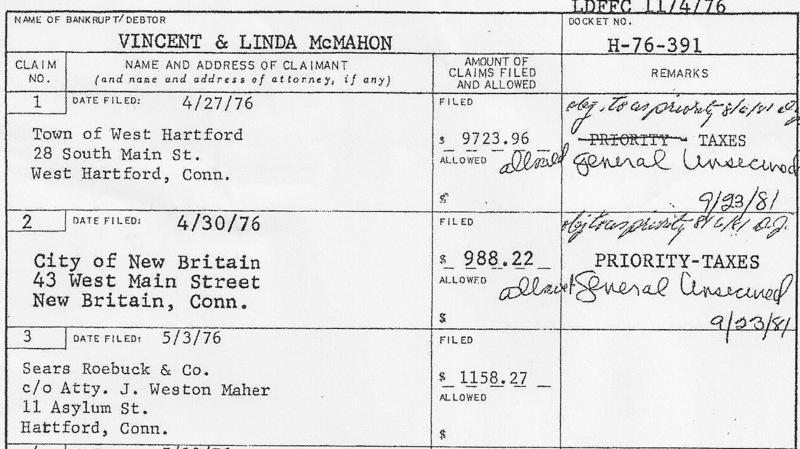 Included on a list of debts to banks, stores, the phone company, unions, individuals and the IRS is an item from April 30, 1976 showing the McMahons stiffed the city where they once lived $988.22. The debt to the Town of West Hartford was considerably higher at $9,729.96. These are paltry sums compared to hundreds of thousands owed the IRS and banks, but are part of the record of a rags-to-riches narrative — riches made possible by taking over a family wrestling enterprise and using sleaze to make a fortune. The press revelations led Mrs. McMahon’s campaign to announce that she and her wrestling mogul husband will now repay some of the debts with interest to individuals if they can find them. Under bankruptcy laws, however, debtors may often “discharge” government taxes owed under statutes of limitations and the timing of court actions. Debtors like the McMahons are often given a pass on tax debts to reorganize and start anew without the liability. The McMahons maintain that they paid back taxes and nearly half of the money owed but have not produced any documents to show when debts were paid prior to the revelations reported in recent days. The old adage about not tossing stones from a glass house seems to apply. The McMahon campaign has had great fun poking Mr. Murphy about news reports of his fiscal missteps over the past 10 years – being late on mortgage, rent and car tax payments. But he did pay, and his debts were paltry compared to the McMahons’ 1976 meltdown. Then came word Friday the McMahons were late on paying taxes on their Stamford penthouse. Oops! On the heels of the McMahons’ mea culpa to creditors they had long ago stiffed and forgotten, Linda and Vince (as noted in the Day editorial) were hit with a new tax delinquency this month on their “penthouse” in Stamford, according to a story in the Hartford Courant. Meanwhile, the McMahon campaign, on a track to spend $100 million over two campaigns to buy a U.S. Senate seat, continues its saturation ad campaign on the housing debts of Cong. Chris Murphy — all of which were reconciled and paid in full. She refuses to meet with journalists and editorial boards and has limited her exposure in debates with Murphy, avoiding exchanges on issues that should be front and center in this senate race. McMahon, who hides her Republican affiliation in paid advertising, is also running as fast and far away from the Republican-Romney-Ryan agenda that she would most certainly support in the Senate to protect her wealth and keep her taxes low — WHEN SHE PAYS THEM. In Memoriam: Stanley J. Pac, Sr.
Stanley J. Pac Sr., a longtime Democratic Party leader who served New Britain as Mayor, State Representative and State Senator, died September 21st at the age of 89. Pac, who most recently spoke to the Democratic Town Committee last year, was a New Britain native and lifelong resident. After attaining local offices Pac went on to state positions, serving as Motor Vehicles Commissioner under Governor Ella T. Grasso and Environmental Protection Commissioner under Governor William A. O’Neill. He was a member of Sacred Heart Church and served on its parish and finance councils. He served in the U.S. Marine Corps 1st Marine Division during World War II and was deployed to the South Pacific, where he fought in the Battle of Guadalcanal. Former Mayor Pac was instrumental in the creation of the endowed chair for Polish Studies at Central Connecticut State University. His funeral service will be held Tuesday, Sept. 25, 2012, at 10 a.m. at the Burritt Hill Funeral Home, 332 Burritt St., New Britain, followed by a Mass of Christian Burial at 11 a.m. at Sacred Heart Church, New Britain. Relatives and friends are invited to call Monday from 2 to 4 p.m. and from 6 to 8 p.m. at Burritt Hill. Memorial donations may be made to the Daughters of Mary, c/o Mother Jennifer, 532 Burritt St., New Britain, CT 06053 or American Warrior, P.O. Box 337, 35 Main St., Versailles, CT 06383. To share a memory or condolence with his family, please visit us at www.burritthill.com. New Britain Democrats extend condolences to former Mayor Pac’s family and friends. New Britain Democrat e-letter: John McNamara, Chair and Editor, Post Office Box 2112, New Britain, CT 06050. New Britain Democrat e-letters and updates and ways you can participate may be found at www.newbritaindemocrat.org. IT’S TIME TO GET OUT THE VOTE. To volunteer contact newbritaindemocrat@gmail.com. New Britain Democratic headquarters, 19 Bassett Street, New Britain. This entry was posted in In Memoriam, taxation, Weekend Update. Bookmark the permalink.